The "Electronic Quarterback", my introduction to electronic football. Long before video consoles like Atari and Intellivision, but after the dawn of Pong, there was a phenomenon I haven’t heard too much about: the handheld video game. I owned a few, but one that left a distinct impression was the “Electronic Quarterback”. Going to school every day meant riding the bus. Back then, I rode it with a neighbour named Mike. He came from a big family, including two older brothers, so he always had a lot of cool stuff from Christmas or various birthdays. One day, I hopped on the bus and, when I sat beside him, noticed he was holding something and pressing furiously on various buttons. The frenzied action reached a crescendo with some Muzak-sounding music. I asked what he was doing. Why, playing “Electronic Quarterback” of course. His brother had received it for a present, and he was letting Mike play it to pass the time on the bus. That’s where I got my first taste of the game. Soon Mike let me try, but I really had to learn on my own. I recall him briefly laughing at my futility. Then his older sister scolded him, reminding Mike when he first played the game all he did was press random buttons – which was pretty much what I was doing. Catching just a sniff of that game made me want my own. So that’s what I asked for Christmas. Sure enough, it was waiting for me under the tree when we opened our gifts that Christmas Eve. By then I had played enough to have a basic understanding of the game. Like all football games, it was easy to learn how to run. It was mastering the pass that opened up the offence – kind of like real life and every other video game since. The secret, which I learned by playing hour after hour of “Electronic Quarterback” was that when I hit the pass button, if I hit it again it would keep the pass from being released. It was pretty rudimentary but, in a simpler time, it was a lot of fun. It was so rudimentary in fact, the defence was automated. The players never actually run the defence, just the offence and the special teams. If memory serves, I could punt the ball too. When I got “Electronic Quarterback” that Christmas, I recall playing on the drive over to Christmas dinner at my uncle and aunt’s, and again on New Year's Eve. They just lived up the road, so it wasn’t a long trip. On those trips, and later, I pretended I was the Oakland Raiders, who were set to play the Cleveland Browns in the AFC Divisional Game that year, the 1980-1981 playoffs. (They would go on to win that game, dubbed “The mistake on the lake” when Raider defensive back Mike Davis intercepted a Cleveland pass in the endzone to preserve the win for the Raiders). I had hours and hours of fun playing “Electronic Quarterback” but, like with all toys, I eventually moved on to something else. Intellivision came along, which had a more sophisticated NFL Football, then Commodore 64, and finally, for me, Nintendo and “Tecmo Super Bowl”, which was a bit more sophisticated again. 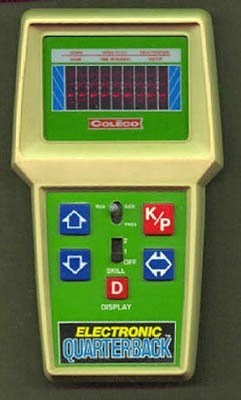 Still, I will always remember that game, my first introduction to electronic football. It’s how I actually began to learn the game. I wonder if my “Electronic Quarterback” is still in my parents’ basement. I’ll keep you posted.